What to wear full. Women tend to be overweight, do not meet the fashion standard, in most cases belong to the fashion calmly, take only parts or even avoid her. They are tied to the traditional type assortment, poluprilegayuschy silhouette, set-in sleeve, solid fabrics with high requirement about the quality of tailoring. Full women should take fashion gradually: be careful to make necessary corrections in form in accordance with the direction of fashion, to look for a new length and desired colors in the color scheme, use fabrics and materials of modern structures. For processing your image, you can use any styles, but in a temperate solution. All types of clothes it is necessary to increase freedom fit in all areas, greater use of a variety of cut sleeves with a comfortable, slightly deeper armholes. Silhouettes recommended for full figures - straight narrow and traditional poluprilegayuschy, but in the new design. 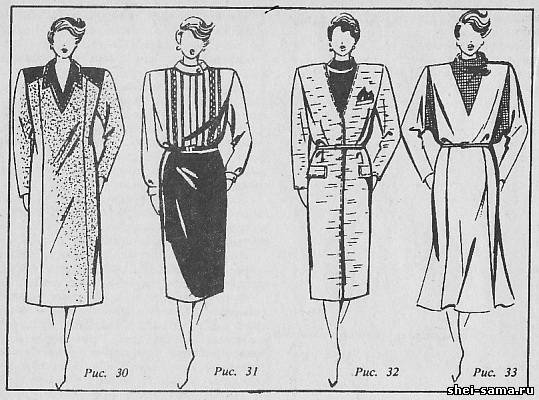 In some types of range, such as winter coats and overcoats, you can use the trapezoidal silhouette, which for many years kept in fashion. The extension of this silhouette down should be moderate, and mostly on the back. For dresses you can also offer silhouette cut at the waist with a soft bodice and straight skirt. But for the full figures of small stature, this silhouette is not recommended. You should be very careful to treat advanced shoulder offered by the fashion. Shoulder line should be almost natural width, but more clear than before. Shoulder pads are available is small. In most cases you can replace the hard gasket. Length of clothing for full figures traditional. Long products - MIDI (mid-calf) can be offered only to women with a predominance of volume in the breast area and slim hips. Items placing clothing, simple, classic shapes. Much attention is paid to the form of collars. They are diverse, but most often performed on the elongated neck. Collars are offered in the English style with long lapels, cholevinae, the type of clamp and different options with asymmetry. Full women are fashionable V-shaped cutouts for openings in summer dresses and blouses and jackets without a collar, with angled sections of the sides (cardigan style). The waist can be accented with a belt - narrow or medium width, which is usually located 2 cm below the waist line. Dress for full figures is simple, with no extra carved lines (Fig. 30) . More important is choosing the right color, exquisite color combinations in the ensemble. Recommended tonal combinations or classic contrasts (black and blue with white, etc.). Critical reception decorating to complete is embroidery. It not only beautifies the product, but also diverts attention from the forms of figures which it is desirable not to detect. From other types of finish widely used the edges, nastronie borders, decorative stitch, finishing parts made of materials with a shiny surface. And, of course, white finishing details. The location of the finish can beat asymmetric. Popular in the fashion of completeness should also be adopted full women. The items that make up the kit is primarily a variety of skirt straight shape. Offers a skirt with pleats placed in the center of the front or back, asymmetrically, the "bushes". Depending on the shape of the level zatrachivaniya folds may be different. For shapes with a predominance of volume in the hips along with straight skirts are extended at the side seams. Strict blouses and feminine style be a necessary addition to a business dress, costumes, sets.Special attention is paid to blouses dressy character with different finishes, tucks, panels of embroidery, using hemstitch, embroidery (Fig. 31). Dresses can also be wear complete with short and extra-long jackets, vests, oblegchenie Besplatnie coat and short coat without fasteners. Warm dresses, coat-dresses, dresses, sundresses, wool fabrics, various PetroChina, cloth is worn with a blouse or a thin sweater (Fig. 32). Single dresses are of various forms. From plastic wool and silk fabrics and knitted fabrics are dress with padded bodice and straight or slightly extended skirt, a skirt cut of the year (Fig. 33). From thin wool fabric, cotton, linen - dress-shirt straight shape dress in the style of Safari. The sleeves of these dresses are short, shirt or cap. Sleeveless dresses for fat women is not recommended. For full figures fashion offers pants, but only in sets and for free time. Their shape is moderately free, straight throughout its length with cuffs and without cuffs. Young woman can make the fashion more active. They offer a wide range of clothing, a variety of multi-disciplinary sets of feminine-romantic and sporty style. But they should avoid slim forms, revealing the figure, very bright and contrasting color kits, body jackets, and overalls.